If Jason’s name seems familiar it’s because I’ve written about him several times. He designs premium WordPress themes over at Press75.com and last year released a free Lifestreaming theme. He also recently updated his personal Lifestream. Jason let me today that he was finishing up documentation and the demo for the theme. 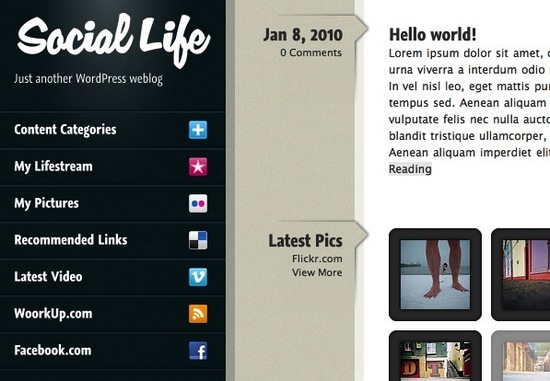 It looks like another nice addition to the ever-growing list of Lifestreaming WordPress themes. I’m looking forward to this latest release and I’ll keep you posted on when it drops. Jason has released a live demo of the theme that you can now see here. Along with the live demo he also posted an image of the admin options for the theme here. After playing with it for a little I’m very impressed. This offers a very nice navigation experience and I like the segregation and ability to filter by content type. The way blog posts are presented as you drill down through the menu is also very cool. I’m also usually not a fan of fluid width designs but this theme does a nice great job of dynamically going to 2 column instead of a single one on my 1920 px width display. If I had to complain about anything it would be that I’d prefer a lightbox effect for the photos & videos to keep the user on the site instead of navigating away. Overall though this is an awesome addition to WordPress Lifestreaming themes and I’m eyeballing using it myself. Social Life looks awesome. Can't wait for the release. This looks great! I've been wanting to convert my lifestream (http://coryobrien.com/) into something that gives different weights to different types of content (more room for photos, less for links for example) and this looks to do just that. Hopefully it's expandable as well so that it can easily handle new services, because if so, I may just find myself switching soon.